Roadside where Ashdale Crescent meets The Quadrant and Cemetery Road. Near Droylsden cemetery. Tall triangular pillar on three-sided base. 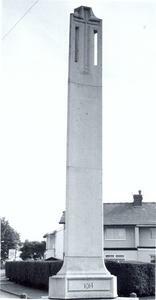 Cross carved into top section of column with vertical slits beneath its arms. Comments: At the day of the unveiling ceremony, a further £700 was needed in order to cover the cost of the memorial.